The Perth Mint of Australia has started accepting orders for a new four coin silver proof set featuring world famous squares. Each coin is struck in 99.99% pure silver and features an aerial view of the individual square in color. 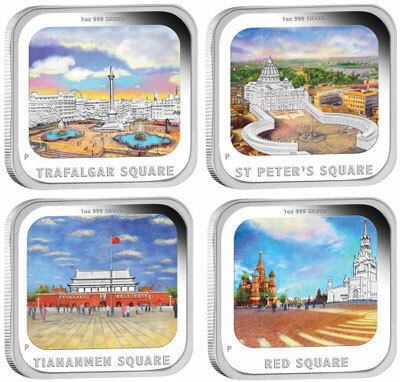 The four coins included in the set depict the beautiful architecture of the St. Peter’s Square in Vatican City; Trafalgar Square in London, England; Red Square in Moscow, Russia; and Tienanmen Square in Beijing, China. Inscriptions indicate the metal weight and purity and the name of each square in bold letters. The reverse designs are by Aleysha Howarth. On the obverse of each coin is the Ian Rank-Broadley effigy of Queen Elizabeth II. Inscriptions include the monetary denomination and 2013 year-date. Each coin contains one troy ounce of 99.99% pure silver and measures 33.2 mm by 33.2 mm with a diameter of 4.00 mm. The coins are issued as Tuvalu legal tender. The Perth Mint will release no more than 1,000 of these World Famous Squares 2013 1oz Silver Proof Four-Coin Sets. The sets are housed in special panoramic presentation packaging which allows both sides of the coin to be viewed. An outer box and numbered certificate of authenticity are also included. For additional information or to place an order, please visit the Perth Mint’s product page.